Rapper Post Malone has unveiled a video for his new song, “Sunflower.” The track is a collaboration with Swae Lee and will be heard in this December’s Spider-Man: Into the Spider-Verse. However you feel about the music, you may be excited to learn that the clip shows new footage from the upcoming animated film. In fact, it might even show too much. So if you don’t want to be spoiled, you’d do well to avert your eyes. Miles Morales (voiced by Shameik Moore in the film) stars in the video and it follows him around New York. Because this is mainly a lyric video, the words show up on screen in creative ways. Miles sings along to the song in his bedroom and later tags the lyrics on a city wall. It’s actually while he’s spraying his graffiti that a rather crucial plot point is spoiled. Specifically, it’s where he’s bitten by the genetically altered spider that grants him the wall-crawling abilities made famous by Peter Parker. Additional shots show Miles coming to grips with his powers while juggling the complexities of his school and home lives. 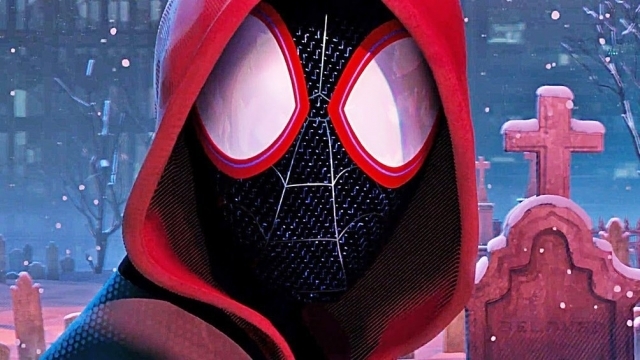 Previously, the cast and crew of Into the Spider-Verse revealed additional plot details about the film during its New York Comic-Con presentation. We learned that Wilson Fisk’s meddling with a super collider brings the various Spider-Men (and woman) into the same universe. Also, the filmmakers confirmed that the fateful meeting between Miles and Jake Johnson’s Peter Parker will happen in a graveyard. Both of those scenes are previewed in this new video, and the animation is still a visual marvel to behold. Spider-Man: Into the Spider-Verse will swing into theaters on December 14. What are your thoughts on the song and the footage shown in the video? Give us your impressions in the comment section below!